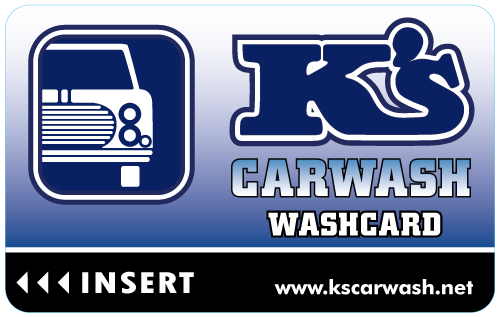 K's Car Wash is proud to provide their customers with the convenience of the WashCard® System. WashCard is the easy way to wash your car without the hassle of exact change or quarters. To use your WashCard, simply select your desired wash and swipe the card through the WashCard reader. Customers can purchase a prepaid WashCard with no charge for the card itself. The balance of the card can be added to at any time with cash, credit card, or online from K's Virtual Storefront. PLUS, get a *10% bonus* added to your WashCard value when you purchase a new card or recharge your exisiting card online or onsite! $20 gets you a $22 WashCard! $50 gets you a $55 WashCard! $100 gets you a $110 WashCard! Use prepaid WashCards for your entire family: Each family member uses their own WashCard, all deducting from the same WashCard balance! Waste and misuse are eliminated with the FleetWash program. Non-traceable Token-Notes and Wash-Tokens are no longer used, ensuring that money isn't being paid out before a service is provided. With a commercial account, we will send out a detailed invoice each month to your business or home, allowing you to view the date and time of each wash. Each card can be programmed to an individual person, vehicle, or department. Perfect for businesses or families that have multiple vehicles and don't want to hand out cash for car washing. You can program cards for unlimited use, set spending limits or you can limit their use by time of day and day of week. FleetWash is a totally cashless procedure. Vehicle operators aren't fumbling around for exact change. And they don't have to worry about collecting and turning in receipts. It's quick and hassle-free. Contact K's Car Wash about Setting Up Your Own FleetWash Account Today!